all the stuff that makes it through the regular filters… could be interesting. 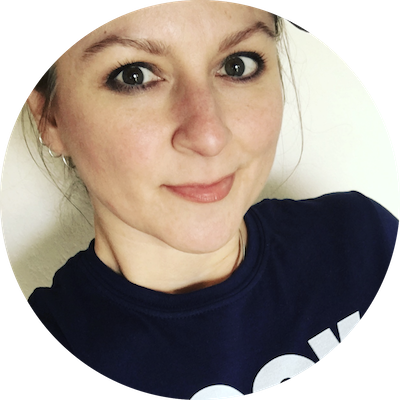 I recently blogged about my self-diagnosis of perioral dermatitis and the switch to a couple of very mild cleansing products. This has been going fairly well, and the skin around my mouth and chin does seem happier, though not clearing totally. That’s fine, as I’m sure these things take time to heal. There may be more to it though, as I can now report the results of seeing my doctor yesterday regarding another thing to do with my face. I seem to experience severe allergies intermittently at meals. I get a hot, red nose, sinus problems, flush cheeks. There doesn’t seem to be an easily identifiable trigger food or beverage, so I went to my GP to see if he could refer me to an allergy specialist. He asked me some questions, pushed and pulled my head around a bit for inspection and then connected the blotches around my mouth and chin to the flushing. He seems to think I have rosacea, and so we’re treating the two as related things. No allergy appointment. 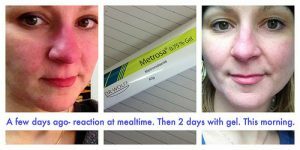 He prescribed me a metronidazole gel to apply twice a day to get things under control. I’m on day two today. There is a difference. I’m using the Dr Bronner soap, the witch hazel toner, and a JASON brand vitamin E (5000) jojoba oil as a general moisturiser. In most cases, this works a treat. If I need to wear eye makeup, I don’t put the oil around my eyes, but instead use a Simple brand daily moisturiser. 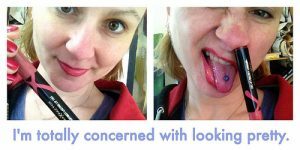 I’ve also found a neat trick to minimise the obvious redness of my skin by trying lip stains. They come in magic marker like tubes and I’m trying two brands right now- Max Factor and NYC. They make me feel prettier. I also like the look of lipstick on me, but don’t wear it often because it gets everywhere and requires frequent touch-ups. The stains are brilliant though. Low maintenance and look good. So, whether it’s allergy, rosacea, perioral dermatitis, or some dastardly combination of them all, I’m making progress in both treating and dealing with it. I’ll update you when there’s more to the story. I’m hoping this info and the photos help someone out there. Over the past handful of months, I’ve noticed a change in my facial skin. Specifically around the mouth/chin area and now a bit around the “laugh lines” too. I had believed it was winter weather and stress, so I was piling on E45 and such, only to see it not clear one bit. 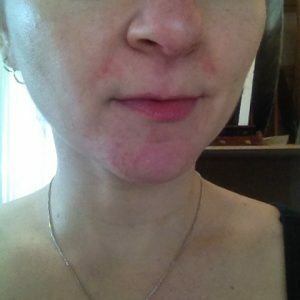 I had looked up rosacea and eczema, but neither fit. I dug deeper with very general googling (red patchy skin around my mouth, and other long-winded search terms) and finally hit on something during a bout of insomnia last night. Perioral dermatitis. It’s a mild case on me, but it is so good to finally know what I’m dealing with (and was incorrectly treating, I might add). To make a long story short, this blog category helped enormously, as did a few medical websites with photos. Perioral dermatitis (for me) is just enough of a nagging, rashy, dry skin thing to make me a little self-conscious, but is quite a problem for others, sometimes requiring antibiotics. I’m going the skincare change route and have just ordered a couple of the baby products off of the UK Dr Bronner site. I’m also getting a bottle of Thayers Unscented Witch Hazel toner. I’m hoping that a little care with the cosmetics and chemicals that I put on my face will clear things up. Most days, I don’t wear makeup at all (and never wear foundation), but I do wash and moisturise twice a day, so there will be tweaks to that routine. So my brain and I have this love/hate thing going on. Always have. I reckon you’re here reading and already know about the ADHD/Bi-polar stuff, so I’ll skip that. Let’s talk about the anxiety I just went through. I didn’t make it into the exhibition I recently went for and tomorrow I pick up my painting in Bristol. Two and a half hours there, two and a half hours back– plenty of time to think irrationally about all kinds of stuff. And I will, but hopefully not for the whole journey. I know I’m good at what I do, and that success will come, but some days it feels like a step forward is greeted with a chorus of pointing fun-makers harmonising a ditty about what a silly optimist I’ve been and I should go eat cake and get a job at the pub. Then there’s the step back (or two) created by my own anxieties about subsequently taking on work that I don’t love, that I’ve been consciously moving away from, but will bring in a few quid. Not succeeding at art? Fall back on web work. I ended up doing half an hour of hard exercise on the stepper (whilst watching Transporter 2 – can I just say: Amber Valletta- I totally would) to get my brain chemicals back on track. If the toughest thing you deal with in your head is a headache or run of the mill emotions, I envy you at times. My eyes were dry from being wide open and darting, my brain felt like the fourth of July and spinning tops. I was helpless. Anxiety + ADHD = incapacitated by crazy. Half an hour of sweating on the stepper and my brain is calm, my mood improved, and I don’t look at my doing web work as a failure of my art career. I could be flipping burgers or pulling pints instead, but I’m fortunate enough to know my way around a WordPress install with some understanding and can help a few hand-picked clients get results they want. I’ll do the work, get paid, and still do my art and not look at the filling of gaps with digital freelance as a bad thing. It’s a good thing. I may have my brain glitches, but I’m beginning to cope with the freak-outs and hurdles in more positive ways lately. To cope with today’s anxiety? I didn’t drink (alcohol), brand my arm (my variety of self-harm), or sleep (= escape)– I exercised my demons in a literal way. I sweated out the poison. And I got the eye candy of Amber Valletta too.